"What am I bid for the Eiffel Tower ?" "Do I hear £300 billion ?!" The next most valuable European attractions are Rome's Colosseum and then the Tower of London ! It is 320m (1,050ft) high. It was built in 1889 at a cost of 8 million francs which is around £30 million today. 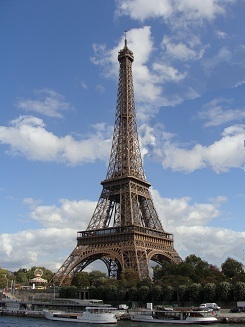 It is named after engineer Gustave Eiffel whose company designed it. It took around 2 years to build. It was built as a symbol for the Universal Exhibition of 1889. It was the tallest monument in the world until New York’s Chrysler Building in 1930. It is the most visited attraction in Europe. When the temperature is very high, the height of the Tower can increase by up to 18 cm. Wind can cause the tower to move sideways - the maximum recorded was a sideways move of 9 cms during the December 1999 storm (don't worry its built to withstand this !). Gustave Eiffel also designed and built the framework for Bartholdi’s Statue of Liberty which now stands at the entrance of New York's harbour.